The food industry is currently flourishing on the back of increased disposable income of urban populations living in metropolitan areas of emerging economies. The food industry players are also leveraging the trends of processed food, ready to eat meals, and innovative packaging. Consequently, the market for mushroom is gaining traction, as they contain striking health benefits and are adequate from aesthetic principles. Put in the category of vegetables, mushrooms contain a number of nutrients such as vitamin, potassium, and selenium. 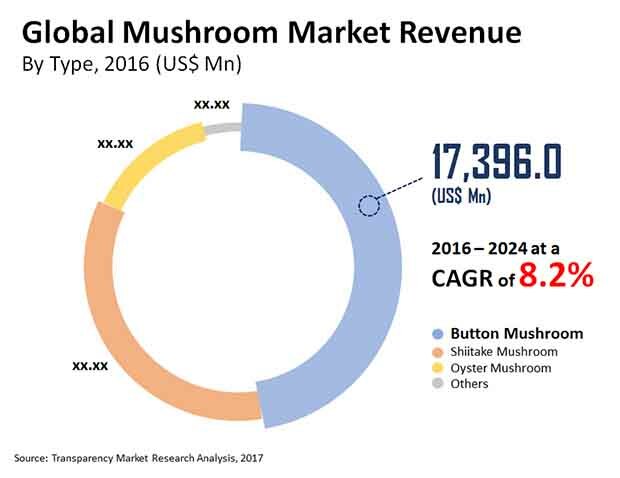 According to an up to business intelligence report developed by Transparency Market Research (TMR), the demand in the global mushroom market will increment at a formidable CAGR of 8.2% during the forecast period of 2016 to 2024, by the end of which the market is estimated to produce opportunities worth US$69,267.9 million. The analyst of the TMR report has detected an intensely competitive vendor landscape in the global mushroom market, which can be attributed to low entry barriers and consequently, entrance of new players who are catering to regional and country-wide demands. That being said, The Mushroom Company, Costa Group, Okechamp S.A., Drinkwater’s Mushroom Ltd., Monterey Mushrooms Inc., Monaghan Mushrooms, Shanghai Finc Bio-Tech Inc., CMP Mushrooms Greenyard NV (Lutece), and Bonduelle SA have been identified as some of the companies that are currently ahead of the curve owing to their well-established distribution network and regular indulgence in the activities of mergers and acquisitions. Based on product type, the mushroom market has been segmented into oyster mushrooms, shiitake mushrooms, and button mushrooms, whereas form-wise, the market has been bifurcated into fresh and processed, which has been further sub-segmented into frozen, dried, and canned. The report has also taken stock of the potential of demand that will be forthcoming from the end users: retail outlets, food processing, and food services. Geographically, the developed country of the U.S. is anticipated to sustain North America as the region of maximum profitability. As of 2016, the region produced more than one third of the global demand for mushrooms. Some of the key factors that are expected to reflect positively on the mushroom market are: increasing consumption of processed foods, rise in consumer awareness regarding health benefits of the vegetable products, and investment by food industry players to cater to large audiences with innovative packaging, which also increments the shelf-life of the products. Additionally, rigorous research and development activities are currently underway to harness the possible applications of mushrooms, which will further fuel the market. On the other hand, strikingly low shelf-life of mushrooms, lack of proper process management, and lack of consumer awareness are obstructing the market from flourishing. Nevertheless, growing concerns of obesity is expected to lure newer consumers who want to reduce meat consumption, and open new opportunities in this market.